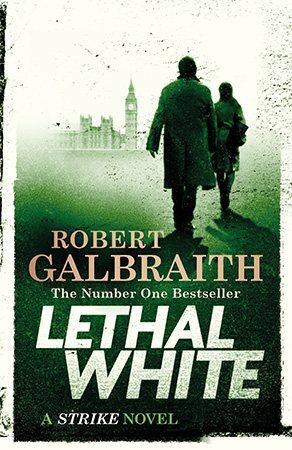 Lethal White is the fourth (4th) book in the “Cormoran Strike” series, written by Robert Galbraith (J. K. Rowling). The series primary characters are Cormoran Strike (Strike) a private detective in London and his temporary clerk, turned investigator, turned partner Robin Ellacott, now Mrs Cunliffe. It was one long book. What’s more, it was also a slowly-paced one. Once again the whodunnit story arc I found simply boring and not especially believable. I might be wrong but if somebody like Billy, an unbalanced, psychotic youth apparently living on the street, came to my office I’d call social services or police, preferably both, and forgot about the whole issue. Why Strike had to engage himself, even though he had plenty of other well-paid investigations to follow, is beyond me. The slow-burning romance between Cormoran and Robin had to carry the whole novel for me and it managed to do exactly that – but with visible effort. I had an impression the characters were stuck in the same routine for the fourth book; even if you enjoy that routine how many times are you able to read the same of the sameness… And those political comments thrown here and there. Do you have to spoil your book with politics? Apparently J.K. Rowling’s answer is a firm ‘yes’. Finally let me pour some acid on the title and quotes from one of Henrik Ibsen plays (Rosmersholm), starting every chapter. They didn’t make sense. I never managed to find a connection between the murder of a politician and an autosomal genetic disorder most prevalent in American Paint Horse even though it was illustrated by a painting done, allegedly, by Stubbs, and fitting those Ibsen quotes with the content of chapters was more often than not pure guesswork. I’m not sure I will be willing to read the next part of this series just for Corm-Robin pairing. This entry was posted in book review, contemporary, crime, mystery, whodunnit and tagged boring, cormoran strike, J.K. Rowling, lethal white, meh, Robert Galbraith, series alert, too much of everything. Bookmark the permalink. JK Rowling really must stay with the HP world. I tried something by her and it was dreadfully slow. Didn’t you say that for the last 2 books? 😛 And don’t get me started on the chapter quotes in these books. They’re like a pebble in my shoe: a minor irritant that quickly becomes the bane of my existence.